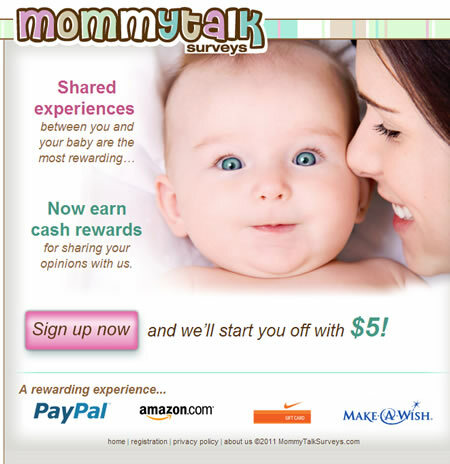 Join Mommytalk Surveys and earn $5 for free just by signing up. “Companies around the world pay top dollar for opinions about baby products and services from mothers like you. We collect basic information related to the products you buy, along with details about your lifestyle and activities. When a survey matches your interests, we alert you via email and post the survey to your MommyTalkSurveys dashboard. Follow the ‘Join Mommytalk Surveys’ link above, or you can use this link. Fill in the information on the sign-up page. Your $5 will be automatically credited to your account. As you qualify for surveys based on your profile information, you’ll earn more rewards and you can redeem them once you accumulate $35 in cash. this is my frist time trying this free stuff and survays so lets see how it really works.